GAM is a global independent asset management group, headquartered in Zurich. It’s been listed on the SIX Swiss Exchange since 2009, following its demerger from the former Julius Baer Group. It has assets under management of CHF 126.9 billion (as at 31 March 2017), and employs around 1,000 staff with offices in 12 countries. GAM sells to a wide range of client segments such as institutions, wholesale intermediaries, financial advisers - and private investors such as expats - through two brands, Julius Baer Funds and GAM. GAM’s investment management business is complemented by a private labelling unit, which provides outsourcing for third-party asset managers. GAM was founded in 1983 by Gilbert de Botton, who is considered the pioneer of the "open architecture" model. In 1999, GAM was acquired by UBS. It remained under the UBS umbrella until the Julius Baer Group acquired it, and three other private banks from UBS in 2005. GAM acquired Augustus Asset Managers in 2009, and later in the year separated from the Julius Baer Group to form an independent, pure-play asset manager. GAM was in the news in April 2017, having been targeted by an activist investor, who was later voted out. In the same month it suffered a minor rebellion at its annual meeting too, over executive pay, but managed to avert an attempt to overhaul its board. Shareholders voted to reject GAM’s non-binding report on pay, with just over 54% of votes cast against it, and only 17.5% in favour. The revolt came after the pay of Chief Executive Alexander Friedman rose more than 20% in 2016, despite profits of the group falling by more than a third. GAM advises us that profits have recovered in 2017. This upheaval at GAM’s AGM is the latest chapter in the company’s history. But between 1999 and 2009, the firm which specialises in active management and stock picking, suffered a volatile decade on the back of two stock market crashes, having several owners, and listing publically during the global financial crisis. Profits of asset managers globally have come under increasing pressure over the last few years. Increasingly investors are switching out of actively managed funds and into passive alternatives, on the back of a large body of academic, evidence-based research indicating that stockpickers – and active fund managers – provide investors with limited value. In an attempt to respond to this global move to passives from active management by investors, GAM purchased British hedge fund firm Cantab Capital Partners recently for $217 million. It did this to increase its offering of computer-driven quantative investment funds that cash in on identifying trends in global financial markets - a big departure from GAM’s predominantly active approach. GAM offers a broad range of funds spread across a wide range of jurisdictions, in an array of currencies, and in all the asset classes. From equities to bonds, mixed and alternative portfolios, absolute return, thematic, sector and geographically specific – you name it, they have it! However, finding the information you need on their website to compare and contrast funds, or just get an overview is difficult because it is so slow. By far the most prevalent of GAM’s funds in the international marketplace are the Star Cautious, Balanced and Growth strategies. The Star Portfolios are multi asset risk rated portfolios. The investment style is to use equity and fixed income asset classes and active mutual funds to try and outperform markets, and provide capital protection. The information we can access is limited, as GAM have a bespoke arrangement with some offshore advisory firms. The information regarding pricing of their sub-fund structure is not public knowledge, and as such we use the C-share class of their Star portfolios as an example. There are cheaper share classes available which exhibit improved performance. So, if you are an investor in GAM funds you must ensure you are in a cost-effective share class. If in doubt, request a free X-Ray Review™ and we’ll help you determine how you’re invested, the fees you’re exposed to, and whether performance is good. What does the data tell us about GAM Star Portfolios? Taking as an example the USD growth strategy, and their respective performance from the GAM website, it is currently underperforming its benchmarks by some margin. 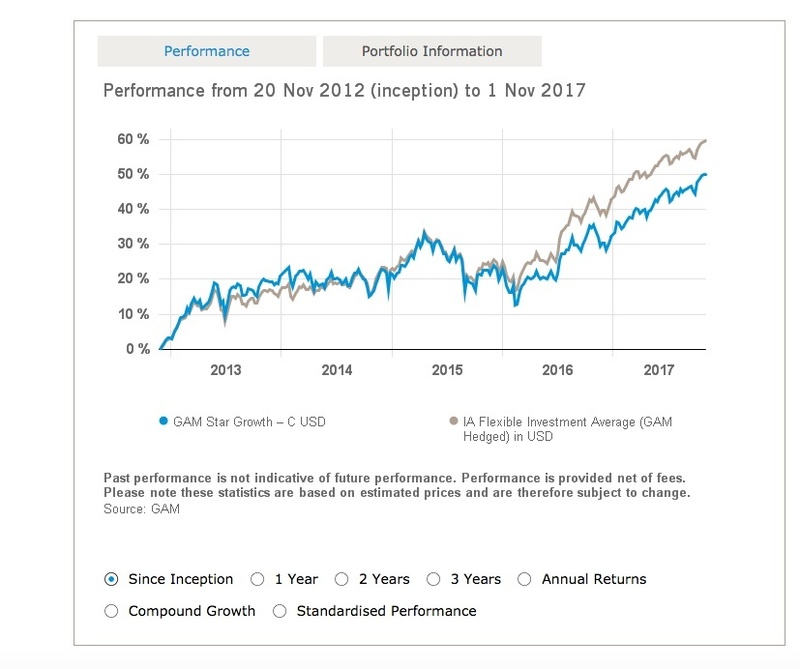 The performance of its C-share class is generally significantly lower than that of any other available share class, so investors may want to consider moving to another GAM share class. If the Star portfolio is wrapped inside an insurance based savings plan, such as an RL360 Quantum Offshore Regular Savings Plan, the fund is mirrored and has a total ongoing running cost (OCF) of 3.16%. This will differ from provider to provider, depending on how much cost the mirroring process adds. Until recently, if the C share class of the fund was used, it would pay an assumed 4% initial commission, termed a “Sales Distribution Charge” to your adviser as well. This increased the cost of the fund (by approximately 1% per annum), making an already expensive fund even more expensive in our opinion. Of course, all of this cost comes from the investor’s money, and that’s without including the costs of the savings product wrapper. What are the objectives of the GAM Star Growth Class C USD Accumulation fund? • The investment objective of the Fund is to achieve long term capital growth. • The Fund seeks to achieve this objective by investment primarily in open ended collective investment schemes which gain exposure to equities (e.g. shares), Fixed Income Securities (with no restriction on the minimum credit rating), property, commodities and currencies. • It is intended that the Fund will maintain a bias towards growth and may invest up to 100% of net assets in equities. The Funds exposure to Fixed Income Securities, property, commodities and currencies may be on an ancillary basis. • Macro considerations will be used in determining the allocation of investments in order to achieve the Fund’s investment objective. • Shares in the Fund can be bought and sold daily (every Business Day of the Fund). • Any income arising from this Share Class will be accumulated. Other share classes of the Fund may distribute income. • The fund manager has discretion in managing the investments of the Fund. • The Fund may use a number of simple derivative instruments for investment purposes and/or efficient portfolio management purposes. Although the use of derivatives may give rise to an additional exposure any such additional exposure will not exceed the Fund's Net Asset Value. This Fund may not be appropriate for investors who plan to withdraw their money within 5 years. What are the fees and charges on the GAM Star Growth Class C USD Accumulation fund? Entry fees of up to 5%! You may be charged a dilution levy of up to 1% of the value of the Shares (representing the cost of buying or selling investments) on entry to or exit from the Fund. The ongoing charges figure is based on expenses for the year ending 31 December 2016 and includes the ongoing charges of the underlying funds. This figure may vary from year to year. It excludes bank interest, portfolio transaction costs and any performance fees if applicable. Are you invested in GAM's funds? Do you agree with our 2 star rating? Or have you enjoyed good returns? Please get in touch with your review. Share your experience to help others with their informed decision making...thank you. Should you invest in GAM Star funds? We believe that there are more cost effective, more transparent and potentially better performing investment options available for the well-informed international investor. The GAM Star portfolios are accessed in the offshore marketplace by financial salespeople on behalf of their clients through offshore bonds. If you hold a fund via an offshore bond you should double check which share class you hold as it could be costing youmore than you need in fees and performance. The total costs of the offshore bonds, together with an adviser’s commission, and charges within funds can create a severe drag on performance. This can impact investment returns massively. If you’re looking for the strongest possible growth on your investments, and you don’t want that to be undermined by high costs, or you are uncomfortable with your adviser accessing investments through an insurance wrapper and/or receiving kickback commission payments, then you may wish to consider alternative options. As an example, index trackers are not only lower cost, but they typically perform better over time, giving you much better returns. They also don’t pay your adviser high up front commission costs through insurance bonds, or ongoing splits of management fees, which is why you often don't get told about them by advisers. If you’d like a free, no obligation review of your current GAM holdings, or your portfolio as a whole, simply request an X-Ray Review™. This is more than just a second opinion – it gives you the facts about the total charges you have paid, the performance of your funds, and any exit penalties that lurk - coupled with clear guidance on your best options moving forwards.